Convenient place. The sink at the room was not running properly. Air conditioning ok ! Poor time starts too late at the morning. they solved the parking ticket problem we had at first entrance. the late night reception was not good, as was not gentle and smiling. Great location for shopping or nightlife. Very nice floor plan for multiple guests or family. The suite arrangement was very accommodating. Great hotel, rooms are nice & big, only downside would be parking is not free. Over all great hotel for the price. 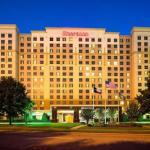 Sheraton Suites Houston near the Galleria, a full-service hotel in the center of uptown Houston, boasts world-class service. The location is convenient to Museum District, Toyota Center, Minute Maid Park, Texas Medical Center, Reliant Park, George R. Brown Convention Center the Theater District, Zoo and downtown. Day spas and premier shops of the Galleria Mall, the fifth largest shopping venue in the US; and the Pavilion at Post Oak are a stroll away. Sheraton provides an array of state-of-the-art facilities like fitness center, lounge, restaurant, pool and meeting space besides elegantly-appointed accommodations. Complimentary local calls, daily newspaper and wireless high-speed Internet are a big plus. Multi-lingual concierge and car rental services are also offered for added convenience. Roomy stylish suites feature ergonomic chairs, refrigerators, coffee makers, television with cable channels and in-room movies, sofa beds, video games, alarm clocks and wet bars. The hotel provides the Sheraton Sweet Sleeper Dog beds upon request. Sparkling outdoor swimming pool and whirlpool are perfect venues to relax and have fun. The first floor has a 24-hr business center for traveling executives and an ATM for emergency cash needs. The onsite gift shop is stocked with thoughtful travel accessories and sundries. The florist would help you in selecting appropriate flowers for any occasion. There is luggage storage on the property. Omaha Steakhouse menu has an impressive selection of dishes, including red pepper garlic mashed potatoes, steaks, grilled chops and desserts. Pets: Yes, pets are allowed. But the hotel charges a fee.